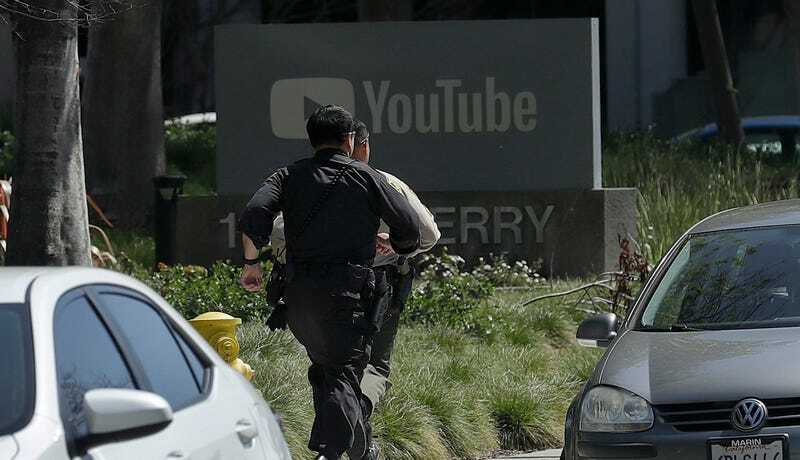 On Tuesday afternoon, at YouTube’s headquarters in San Bruno, California, three people sustained gunshot wounds, one critically, after a shooter reportedly opened fire with a handgun in an outdoor courtyard. A few hours after the story broke, the New York Times reported that police believed the shooter to be an as of yet unidentified woman, who died at the scene from a self-inflicted gunshot wound. Ed Barberini, police chief of the San Bruno Police Department, said at a news conference on Tuesday that the three wounded were being treated at Zuckerberg San Francisco General, which the Times reported contains San Francisco’s sole Level 1 trauma center. At that same news conference, a spokesperson for the hospital named Brent Andrew partially identified the victims as a 27-year-old woman in fair condition, a 32-year-old woman in serious condition, and a 36-year-old man in critical condition. Trump tweeted the atrocious (because wildly insubstantial) “thoughts and prayers” we are all too used to hearing in response to mass gun violence in the United States. [Update 4/4, 1:45 AM]: The female shooting suspect was identified, by two law enforcement sources who spoke to CNN, as Nasim Aghdam.